Some of My Favourite Swiss Roll Recipes – MAASI IS TRYING! Don’t we all want to get a little creative in our kitchens? Well, most of you already are but today I want to show you that being creative and original can be very basic and rewarding. Playing around an old favorite is never easy, but with a little dedication and some hard work, (yes the love of food can make its way into the busiest of schedules, trust me) we can come up with things that would take a lifetime to forget! It’s all about a few creative twists and turns to the humble sponge. 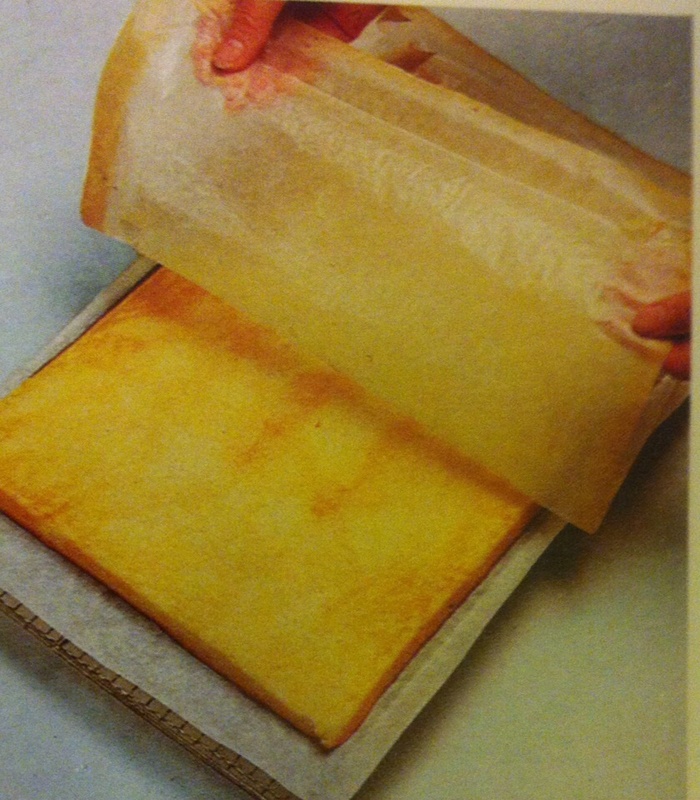 A good sponge cake sheet can be the basis for a variety of delicious desserts. 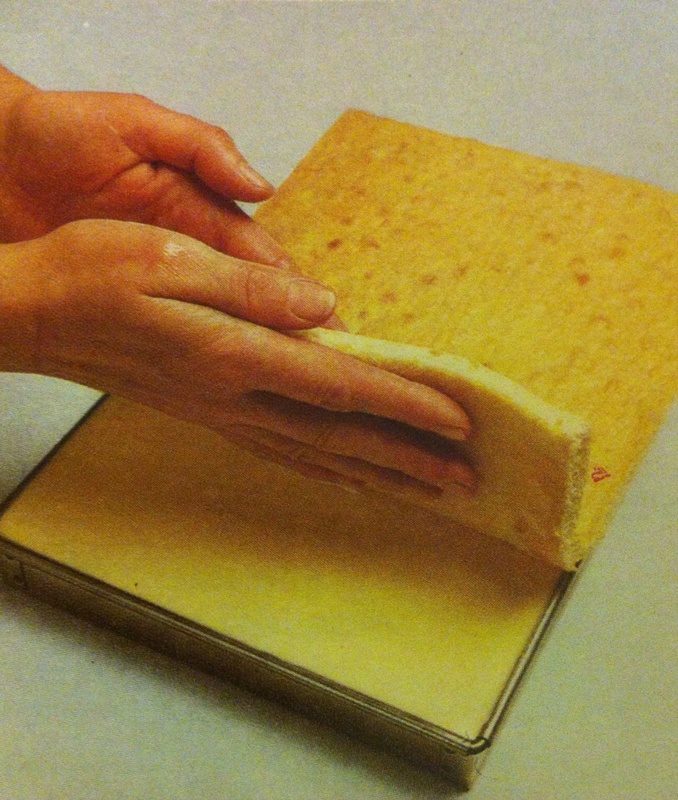 Let’s start with some tips for a perfect sponge every time. 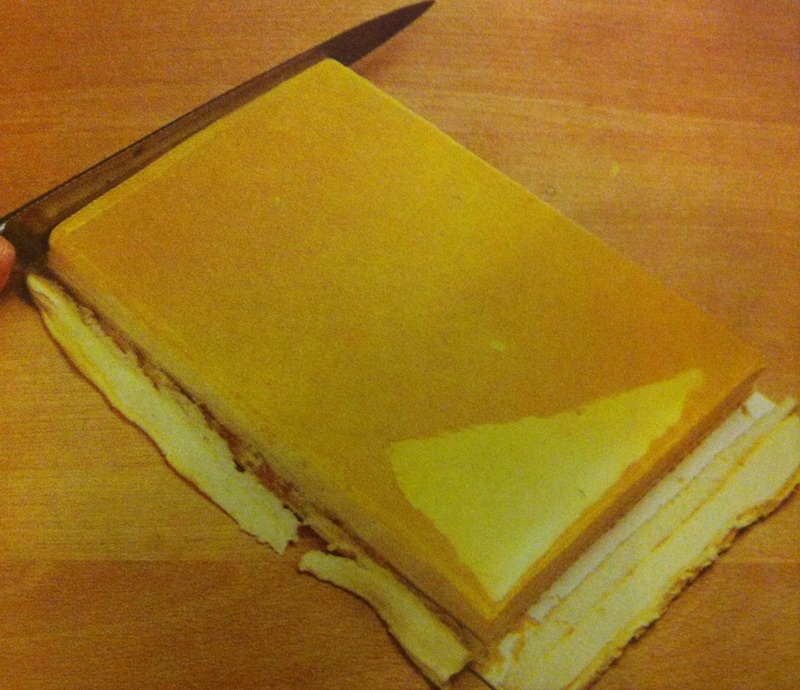 The cake batter is always baked in a large shallow Swiss roll tin to make sheets of sponge. To prevent it from sticking to the pan and breaking when you take it out, butter the tin, line it with greaseproof paper and then butter again. Once the cake has cooled down, you can then start filling it with fruit mousses (any soft fruit mango berries peaches), chocolate ganache or cream patisserie. You can get as versatile with the fillings and toppings as you please…how about a layer of homemade jelly or walnuts and cream? It all depends on your mood and what flavours amuse you the most. Today I want to share with you all some combinations for filling and toppings I adore. 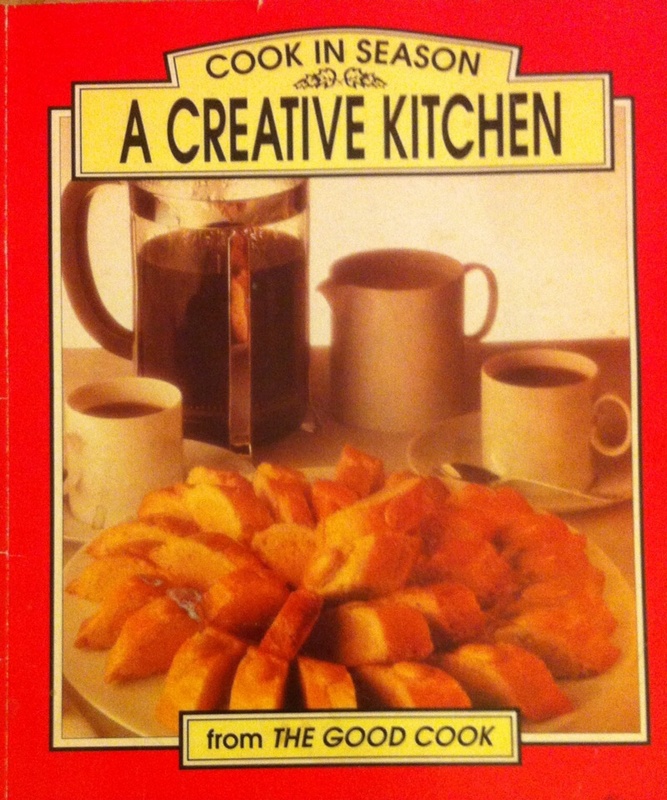 So that basically means that I’ll be sharing some recipes from one of my favourite cookbooks, “The Creative Kitchen”. The recipes include peach fruit mousse, chocolate ganache and walnuts and cream topping. Let’s get working mommies ! Start with pouring some tropical juice in the gelatin to soften it, mix until smooth. Melt the sugar in the water over a low flame, while stirring gently. Gradually increase the heat and boil the syrup. Then take it off heat and immediately dip the base of pan in cold water to stop the cooking process. Put this hot syrup on the beaten egg whites in a thin stream, whisking without break and continue beating until all the syrup is incorporated and the meringue is cool. NOTE: what you ‘re making here is a meringue. 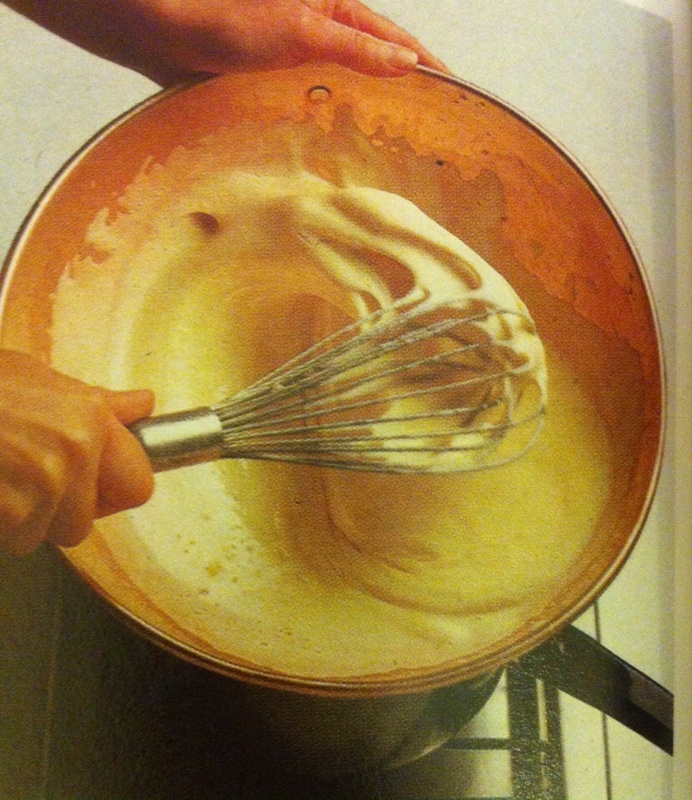 The finished meringue should be very shiny and white and form a stiff peak on the end of your whisk. Now melt the smooth gelatin and peach juice mixture over a low heat and add the rest of the peach juice as well. Carefully fold the gelatin and juice into the meringue, and then fold in the whipped cream as well. Put the chocolate and cream in a heavy based saucepan over a low heat and stir until all chocolate has melted. Continue mixing over heat for about 10 more minutes, but do not bring to a boil. The chocolate cream mixture should be smooth and thick by now. Now pour the mixture into a large bowl and refrigerate at least an hour. When you take the bowl out of the fridge whisk the chocolate mixture with an electric beater for 10 minutes or until it doubles in volume, very light in texture and a pale brown. Mix together all of the above and chill overnight. Use the Swiss roll tin to pour over some jelly into, let chill and set completely, top with the fruit mousse and finish with the sponge cake sheet, trimmed to fit the top of the tin. 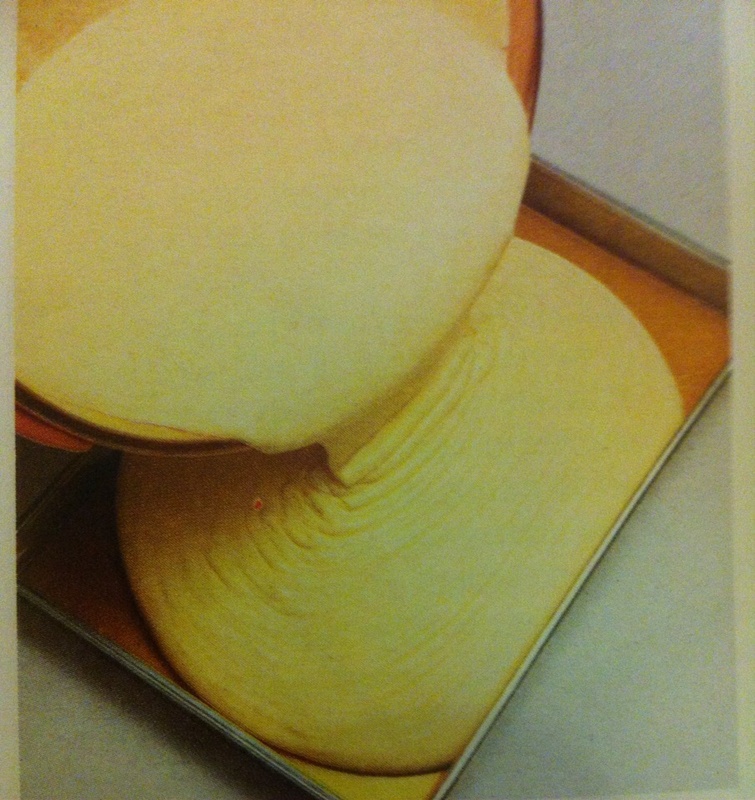 Take the finished layers out by placing the tin upside down so you see the jelly layer on top. 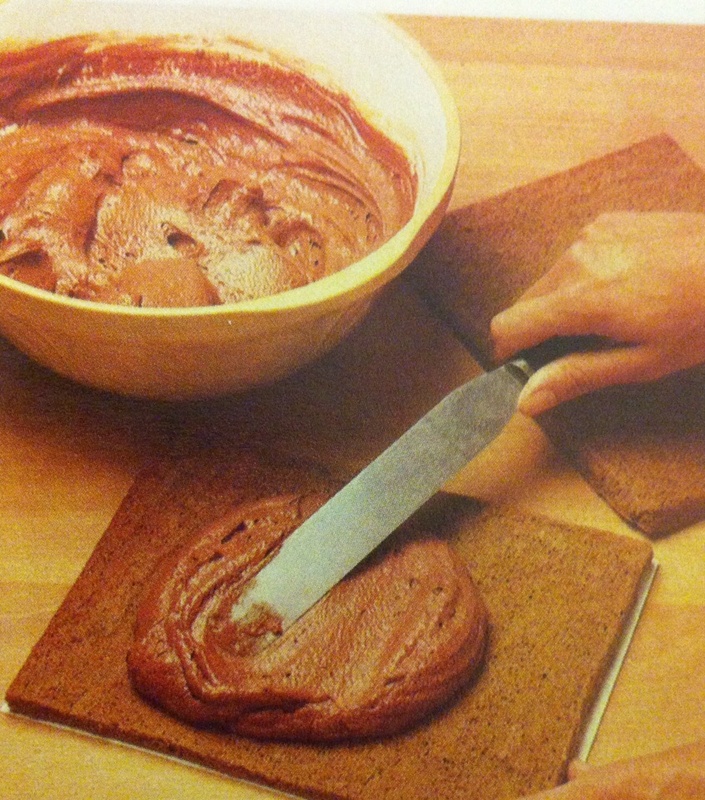 Or simply spread the walnut whipped cream onto the cake sheet and roll it to make a lovely Swiss roll. Next PostNext Straight From My Heart!